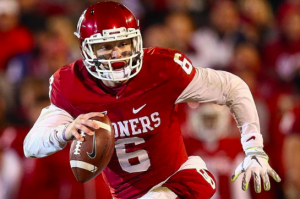 Baker Mayfield To Play in College Football Playoff Despite "Flu-Like Symptoms"
Oklahoma Sooners and Heisman Trophy winner Baker Mayfield picked an inopportune time to get sick. Less than 48 hours before Oklahoma faces the Georgia Bulldogs in the Rose Bowl, Mayfield is battling “flu-like symptoms.” Fortunately for the Sooners, Mayfield was healthy enough to partake in Saturday’s media session. He also says there’s no way his illness will keep him from playing in the semifinals of the College Football Playoff Monday afternoon in Pasadena. Mayfield says he began to feel ill when he went home to spend Christmas with his family. He says his hotel room is currently filled with various medicines and several boxes of tea. The illness has kept Mayfield from participating in this week’s bowl festivities, including a trip to Disneyland. In fact, he initially stayed behind during Saturday’s media session. But after seeing his teammates on television answering questions, specifically questions about him, Mayfield tracked down a ride and made an appearance. Oklahoma head coach Lincoln Riley was hoping Mayfield would be healthy enough to make an appearance for the media on Saturday. Riley knew without Mayfield, reporters would flock to backup quarterback Kyler Murray, which is exactly what happened. Murray gave reporters standard answers about being ready just in case he needs to step in for Mayfield in the most important game of the season. But eventually the Heisman winner showed up, much to Riley’s delight. Despite missing some bowl functions, Mayfield has been present at team practices all week, even if Riley says his energy level is not quite 100%. At this point, there doesn’t seem to be any doubt that Mayfield will play on Monday. Only time will tell if his illness will have any impact on his performance against Georgia. One thing for sure is that the Bulldogs aren’t going to overlook the Oklahoma offense just because Mayfield has been a little under the weather. Oklahoma will meet Georgia in the Rose Bowl Monday at 5:00 EST in the first of two national semifinals. Clemson and Alabama will meet later that night in the Sugar Bowl. The two winners will meet the following Monday for the right to be named national champion.